The team of researchers, including lead author Simon Armitage from Royal Holloway, University of London, discovered an ancient human toolkit at the Jebel Faya archaeological site in the United Arab Emirates. It resembles technology used by early humans in east Africa but not the craftsmanship that emerged from the Middle East, they say. This toolkit includes relatively primitive hand-axes along with a variety of scrapers and perforators, and its contents imply that technological innovation was not necessary for early humans to migrate onto the Arabian Peninsula. 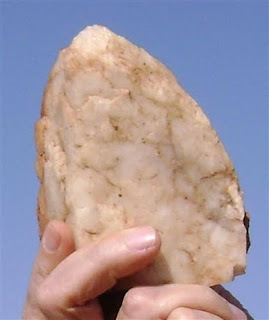 Armitage calculated the age of the stone tools using a technique known as luminescence dating and determined that the artifacts were about 100,000 to 125,000 years old. Together with the North Africa evidence, Skhul/Qafzeh, and possibly Zhirendong, the new paper suggests that by 100ky ago, modern humans were already a fairly widely distributed species. See also: Persian Gulf Oasis hypothesis. Simon J. Armitage et al. The timing of the dispersal of anatomically modern humans (AMH) out of Africa is a fundamental question in human evolutionary studies. Existing data suggest a rapid coastal exodus via the Indian Ocean rim around 60,000 years ago. We present evidence from Jebel Faya, United Arab Emirates, demonstrating human presence in eastern Arabia during the last interglacial. The tool kit found at Jebel Faya has affinities to the late Middle Stone Age in northeast Africa, indicating that technological innovation was not necessary to facilitate migration into Arabia. Instead, we propose that low eustatic sea level and increased rainfall during the transition between marine isotope stages 6 and 5 allowed humans to populate Arabia. This evidence implies that AMH may have been present in South Asia before the Toba eruption (1). This seems like a very good case for the presence of something (B006 haplotype) clearly non-African and Neandertal-related in non-Africans. 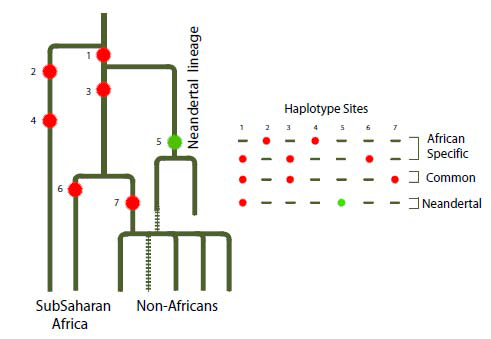 What I find most interesting, however, is the presence of African-specific haplotypes that seem quite divergent from the most common human haplotypes. 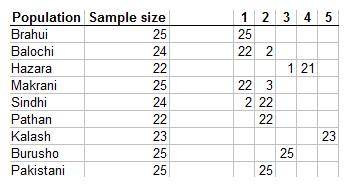 For example (Table 1), haplotype B006 differs from the modal Eurasian haplotype B001 (which is common to Eurasians and Africans) at 13 sites, and B007 (which is African-specific) differs from B001 at 11 sites. It seems to me that B007 might represent archaic African admixture. It is also not clear why the common haplotype in Neandertals and Eurasians cannot be due to modern human admixture in Neandertals. Recent work on the Neandertal genome has raised the possibility of admixture between Neandertals and the expanding population of H. sapiens who left Africa between 80 Kya and 50 Kya to colonize the rest of the world. Here we provide evidence of a notable presence (9% overall) of a Neandertal-derived X chromosome segment among all contemporary human populations outside Africa. Our analysis of 6092 X-chromosomes from all inhabited continents supports earlier contentions that a mosaic of lineages of different time depths and different geographic provenance could have contributed to the genetic constitution of modern humans. It indicates a very early admixture between expanding African migrants and Neandertals prior to or very early on the route of the out-of-Africa expansion that led to the successful colonization of the planet. John Hawks points me towards this commentary in Science. I have always said that Africa was home to a structured population, due to its status as the birthplace of Homo and great ecological variability. Debates about African prehistory have traditionally centered on a few regions such as East Africa, with its fossil-friendly dry climate and South Africa where the number of important fossils is more a function of the presence of European colonists than the region's importance. So, it's good to see that more regions of the continent are receiving the scrutiny they deserve. Was North Africa the Launch Pad for Modern Human Migrations? Until very recently, most researchers studying the origins of Homo sapiens focused on the fossils of East Africa and the sophisticated tools and ornaments of famed South African sites such as Blombos Cave. Few scientists thought that much of evolutionary significance had gone on in North Africa, or that the region's big-toothed, somewhat archaic-looking hominins might be closely related to the ancestors of many living people. Now, thanks to new excavations and more accurate dating, North Africa boasts unequivocal signs of modern human behavior as early as anywhere else in the world, including South Africa. Climate reconstructions and fossil studies now suggest that the region was more hospitable during key periods than once thought. The data suggest that the Sahara Desert was a land of lakes and rivers about 130,000 years ago, when moderns first left Africa for sites in what is today Israel. And new studies of hominin fossils suggest some strong resemblances—and possible evolutionary connections—between North African specimens and fossils representing migrations out of Africa between 130,000 and 40,000 years ago. Archaeological evidence suggests that grape domestication took place in the South Caucasus between the Caspian and Black Seas and that cultivated vinifera then spread south to the western side of the Fertile Crescent, the Jordan Valley, and Egypt by 5,000 y ago (1, 21). 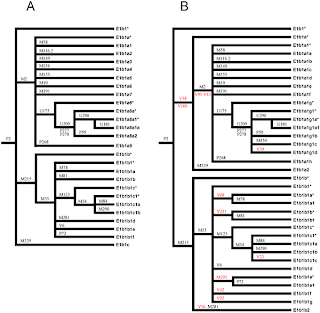 Our analyses of relatedness between vinifera and sylvestris populations are consistent with archaeological data and support a geographical origin of grape domestication in the Near East (Fig. 4 and Table 1). The genetic confirmation of the archaeological inference is particularly interesting, since "wine"is part of the Proto-Indo-European lexicon, and has related forms in both Kartvelian (South Caucasian) and Semitic languages. The Transcaucasus seems a quite good place to seek early contact between these three language families. Interestingly, the area between the Black Sea and Caspian is also where genetic analysis of Indo-Aryan origins has brought me. The grape is one of the earliest domesticated fruit crops and, since antiquity, it has been widely cultivated and prized for its fruit and wine. Here, we characterize genome-wide patterns of genetic variation in over 1,000 samples of the domesticated grape, Vitis vinifera subsp. vinifera, and its wild relative, V. vinifera subsp. sylvestris from the US Department of Agriculture grape germplasm collection. 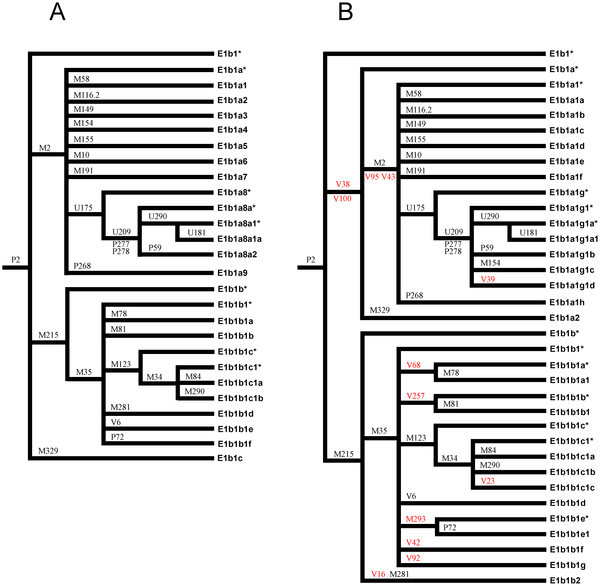 We find support for a Near East origin of vinifera and present evidence of introgression from local sylvestris as the grape moved into Europe. High levels of genetic diversity and rapid linkage disequilibrium (LD) decay have been maintained in vinifera, which is consistent with a weak domestication bottleneck followed by thousands of years of widespread vegetative propagation. The considerable genetic diversity within vinifera, however, is contained within a complex network of close pedigree relationships that has been generated by crosses among elite cultivars. We show that first-degree relationships are rare between wine and table grapes and among grapes from geographically distant regions. Our results suggest that although substantial genetic diversity has been maintained in the grape subsequent to domestication, there has been a limited exploration of this diversity. We propose that the adoption of vegetative propagation was a double-edged sword: Although it provided a benefit by ensuring true breeding cultivars, it also discouraged the generation of unique cultivars through crosses. The grape currently faces severe pathogen pressures, and the long-term sustainability of the grape and wine industries will rely on the exploitation of the grape's tremendous natural genetic diversity. Can we be sure which mummy was the daddy? When a state-of-the-art DNA analysis of Tutankhamun and other ancient Egyptian royals was published last year, its authors hailed it as "the final word" on the pharaoh's family tree. But others are now voicing doubts. The analysis of 11 royal mummies dating from around 1300 BC was carried out by an Egyptian team led by Egypt's chief archaeologist Zahi Hawass. The project was overseen by two foreign consultants, Albert Zink of the EURAC Institute for Mummies and the Iceman in Bolzano, Italy, and Carsten Pusch of the University of Tübingen, Germany. The researchers used the DNA data to construct a family tree of Tutankhamun and his immediate relatives. The study, published last February in the Journal of the American Medical Association (vol 303, p 638), concluded that Tutankhamun's father was the pharaoh Akhenaten, that his parents were brother and sister, and that two mummified foetuses found in Tutankhamun's tomb were probably his stillborn daughters – conclusions that have since become received wisdom. But many geneticists complain that the team used inappropriate analysis techniques. Far from being definitive, the study is "not seen as rigorous or convincing", says Eline Lorenzen of the Center for GeoGenetics at the Natural History Museum in Copenhagen, Denmark. "Many of us in the DNA community are surprised that this has been published." To judge the quality of the team's results, Lorenzen and others are asking for access to raw data not included in the Journal of the American Medical Association paper – but Zink is reluctant to oblige, fearing the data would spark "a lot of arguing" over technicalities. However, Zink, Pusch and colleagues insist that they will soon be able to put any doubts to rest. They say they have also extracted the mtDNA that Lorenzen and others consider necessary for rigorous genetic analysis and are still working on the data. They hope to publish the results this year. But the critics are still advising caution. "When working with samples that are so well-known, it is important to convince readers that you have the right data," says Lorenzen. "I am not convinced." I don't understand what is the problem with "arguing over technicalities". That's the whole point of releasing as much data as possible, to make it easier for others to evaluate your conclusions. I don't understand why a scientist would want data to be hidden: perhaps it might make sense for nuclear scientists or virus experts to keep some data hidden, but why would Tut's DNA be hidden? People who liked at Tut's alleged Y-STR values from screencaps have concluded that he belonged to haplogroup R1b; as this is a rare haplogroup in Egypt, and frequent in Europe, it has sparked debate about his origins. If the Y-STR values are legit, an alternative explanation is that the ancient DNA is not authentic but represents a European contaminant. In any case, I hope that as much data as possible about the case is released, so that everyone can make an informed assessment. Here is a new journal whose content seems reminiscent of what a Hari Sheldon might write. From the journal's definition of "cliodynamics"
‘Cliodynamics’ is a transdisciplinary area of research integrating historical macrosociology, economic history/cliometrics, mathematical modeling of long-term social processes, and the construction and analysis of historical databases. Here is a Wikipedia page for Peter Turchin, the journal's editor, and his welcome to the new journal. I had previously linked to a paper by Turchin and Scheidel about a possible link between coin hoard size and population. Why Has the Number of International Non-Governmental Organizations Exploded since 1960? An interesting set of topics for sure! A team of researchers based their findings on data from 9,000 wooden artifacts from the past 2,500 years. They found that periods of warm, wet summers coincided with prosperity, while political turmoil occurred during times of climate instability. There are theories a-plenty about the Western Roman Empire's demise, and prima facie this seems as good as any. It has a desirable property that, unlike more "historical process" explanations, there is no indeterminedness of whether something that occurred was a symptom of the decline, or its cause: tree rings are presumably oblivious to human societal organization. I was recently reading a book on the subject, I believe it was the Grand Strategy of the Byzantine Empire but correct me if I'm wrong, which made the point that the eastern Empire should have been a better candidate for failure for several reasons, including the fact that it was partitioned across three continents, and faced more formidable foes. Did climate do the Western Romans in? A good test of the theory would be to identify other instances (in space or time) where climate can be linked to social organization; obviously there are not that many candidates with a continuously recorded history that long, and the fact that climate may have unstabilized the Western Empire does not mean that every "collapse" can be traced to climate. Climate variations have influenced the agricultural productivity, health risk, and conflict level of preindustrial societies. Discrimination between environmental and anthropogenic impacts on past civilizations, however, remains difficult because of the paucity of high-resolution palaeoclimatic evidence. Here, we present tree ring–based reconstructions of Central European summer precipitation and temperature variability over the past 2500 years. Recent warming is unprecedented, but modern hydroclimatic variations may have at times been exceeded in magnitude and duration. Wet and warm summers occurred during periods of Roman and medieval prosperity. Increased climate variability from ~AD 250 to 600 coincided with the demise of the Western Roman Empire and the turmoil of the Migration Period. Historical circumstances may challenge recent political and fiscal reluctance to mitigate projected climate change. Characterizing the genetic structure of worldwide populations is important for understanding human history and is essential to the design and analysis of genetic epidemiological studies. In this study, we examined genetic structure and distant relatedness and their effect on the extent of linkage disequilibrium (LD) and homozygosity in the founder population of Quebec (Canada). In the French Canadian founder population, such analysis can be performed using both genomic and genealogical data. We investigated genetic differences, extent of LD, and homozygosity in 140 individuals from seven sub-populations of Quebec characterized by different demographic histories reflecting complex founder events. Genetic findings from genome-wide single nucleotide polymorphism data were correlated with genealogical information on each of these sub-populations. Our genomic data showed significant population structure and relatedness present in the contemporary Quebec population, also reflected in LD and homozygosity levels. Our extended genealogical data corroborated these findings and indicated that this structure is consistent with the settlement patterns involving several founder events. This provides an independent and complementary validation of genomic-based studies of population structure. Combined genomic and genealogical data in the Quebec founder population provide insights into the effects of the interplay of two important sources of bias in genetic epidemiological studies, unrecognized genetic structure and cryptic relatedness. During the colonization of the world, after dispersal out of African, modern humans encountered changeable environments and substantial phenotypic variations that involve diverse behaviors, lifestyles and cultures, were generated among the different modern human populations. 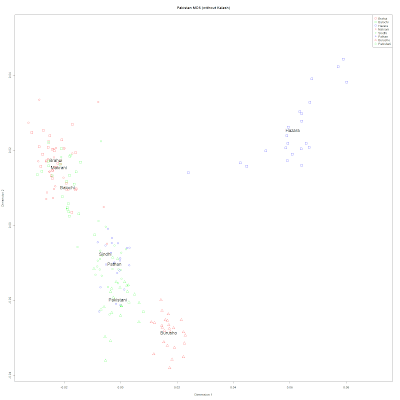 Here, we study the level of population differentiation among different populations of human genes. Intriguingly, genes involved in osteoblast development were identified as being enriched with higher FST SNPs, a result consistent with the proposed role of the skeletal system in accounting for variation among human populations. Genes involved in the development of hair follicles, where hair is produced, were also found to have higher levels of population differentiation, consistent with hair morphology being a distinctive trait among human populations. Other genes that showed higher levels of population differentiation include those involved in pigmentation, spermatid, nervous system and organ development, and some metabolic pathways, but few involved with the immune system. Disease-related genes demonstrate excessive SNPs with lower levels of population differentiation, probably due to purifying selection. Surprisingly, we find that Mendelian-disease genes appear to have a significant excessive of SNPs with high levels of population differentiation, possibly because the incidence and susceptibility of these diseases show differences among populations. 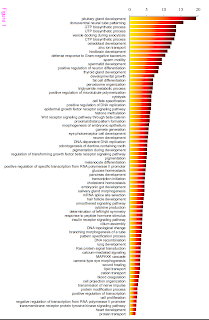 As expected, microRNA regulated genes show lower levels of population differentiation due to purifying selection. Our analysis demonstrates different level of population differentiation among human populations for different gene groups. The paper is free, so you can make up your own mind on its thesis. In my opinion there's no such thing as a "religiosity" gene, and if religiosity drives genetic evolution, we now live in the genomics era, and I'd like to see which genes are on the increase due to increased fertility of the religious. That shouldn't be very hard to study: take a homogeneous ethnic group and see whether there are any genetic differences between the religious/not-religious. Religious people nowadays have more children on average than their secular counterparts. This paper uses a simple model to explore the evolutionary implications of this difference. It assumes that fertility is determined entirely by culture, whereas subjective predisposition towards religion is influenced by genetic endowment. People who carry a certain ‘religiosity’ gene are more likely than average to become or remain religious. The paper considers the effect of religious defections and exogamy on the religious and genetic composition of society. Defections reduce the ultimate share of the population with religious allegiance and slow down the spread of the religiosity gene. However, provided the fertility differential persists, and people with a religious allegiance mate mainly with people like themselves, the religiosity gene will eventually predominate despite a high rate of defection. This is an example of ‘cultural hitch-hiking’, whereby a gene spreads because it is able to hitch a ride with a high-fitness cultural practice. The theoretical arguments are supported by numerical simulations. It is wonderful to see a sample from the medieval period, thanks to the Sagalassos division. 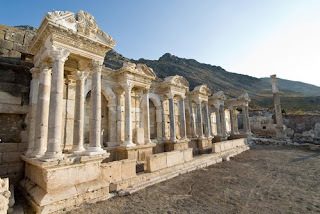 The city of Sagalassos is in Pisidia (southwest Anatolia). This work analysed 85 individuals excavated from two different locations: 57 skeletons were recovered from pits in the context of a slope composed of earthquake debris caused by a seismic event in the late 6th century AD, flanking the area of the ‘Lower Agora’, whereas 28 individuals were found in a neighbouring churchyard, within the adjoining ‘Apollo Klarios Shrine’.11 The archaeological context pointed to low social status burials that followed the Christian tradition (see Supplementary Text). All graves have been dated to the 11th–13th century cal AD by AMS carbon-14 dating of human bones (Analytic Inc. http://www.radiocarbon.com) and/or from the stratigraphical sequencing coupled with the general historical reconstruction of the site. DNA extractions were made from more than 169 bone and tooth samples from the 85 skeletons. 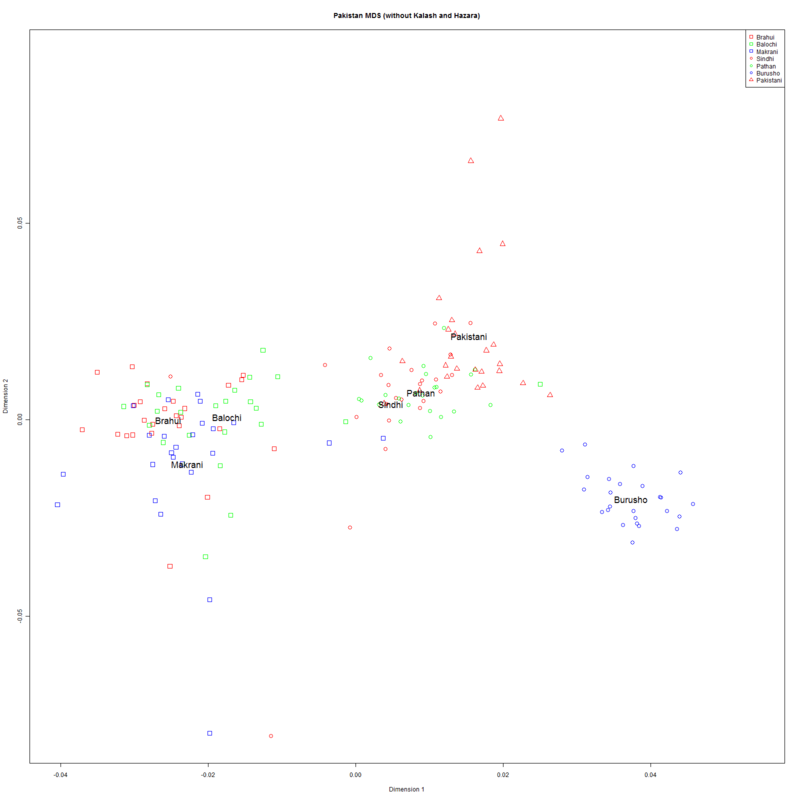 Nothing too surprising here, as the closest genetic distances seem to be overall with Anatolian, Balkan, and Italian populations. There is more information in the supplementary material, with the first few closest populations being Bulgarian, Turkey_East Anatolian, Turkey_Anatolian, Croatian, Central Greek, Ukrainian_Crimean, and Cyprus, i.e., regions with a well known Greek/Roman/Byzantine historical heritage. The close relationship with modern Turkish populations is consistent with the idea of only a small Central Asian contribution to the Turkish population. However, we should use the mtDNA evidence with caution, as the Supplementary material reveals that the various Turkish samples have negative or small Fst with a number of different populations. 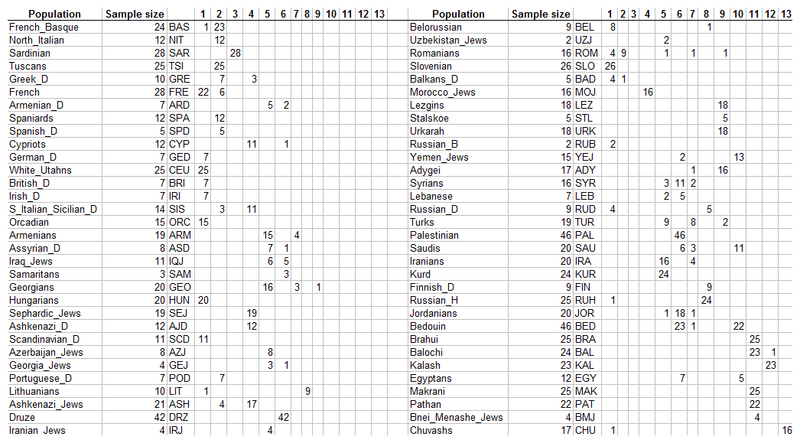 As an additional issue, it should be noted that our results detected a genetic affinity with Crimean Tartars (Figure 2, 3). This affinity has to be considered with caution due to the small sample size (20 individuals), and the absence of historical records of interactions between this people and southwest Anatolia. Historically, the Crimea was colonized in the 7th and 6th centuries BC by Miletos, due to the increasing pressure of the Lydians and the loss of lands. During the earlier 1st century BC Crimea became part of Mithridates VI’s Pontic Kingdom. All Sagalassos sequences fall into a set of haplogroups within macrohaplogroups N (X, W and N1b) and R (R0a, H, V, HV, U, K, J and T) that are characteristic of West Eurasians. None of the sequences from Sagalassos belong to the East/South Asian macrohaplogroup M and subSaharan haplogroups (L1, L2 and L3A). I particularly recommend that you take a look at the extensive Supplementary material of the paper which is invaluable for the student of mtDNA. The archaeological site of Sagalassos is located in Southwest Turkey, in the western part of the Taurus mountain range. Human occupation of its territory is attested from the late 12th millennium BP up to the 13th century AD. By analysing the mtDNA variation in 85 skeletons from Sagalassos dated to the 11th–13th century AD, this study attempts to reconstruct the genetic signature potentially left in this region of Anatolia by the many civilizations, which succeeded one another over the centuries until the mid-Byzantine period (13th century BC). Authentic ancient DNA data were determined from the control region and some SNPs in the coding region of the mtDNA in 53 individuals. Comparative analyses with up to 157 modern populations allowed us to reconstruct the origin of the mid-Byzantine people still dwelling in dispersed hamlets in Sagalassos, and to detect the maternal contribution of their potential ancestors. By integrating the genetic data with historical and archaeological information, we were able to attest in Sagalassos a significant maternal genetic signature of Balkan/Greek populations, as well as ancient Persians and populations from the Italian peninsula. Some contribution from the Levant has been also detected, whereas no contribution from Central Asian population could be ascertained. Causes previously suggested for the sudden extinction of Neanderthals (Homo neanderthalensis) in Europe, starting around 35,000 years ago, comprise food shortage, climatic effects and violence from Modern Humans. The aim here is to formulate a demographic model with reconstructed fertility and death rates, capable of modelling the population development under conditions of changing climate and prey availability, from the early appearance of Neanderthals in Europe about 260,000 years ago to their demise. Parameter variation studies are made for the parameters considered to have the highest uncertainty. Finally, the option of regional migration between northern, middle and southern Europe is added, in order to capture population movements away from a region in response to deteriorating or improving climate. This model accounts for population developments, including the re-population of the Middle and Northern regions of Europe during and after the warm Eem period. However, parameter choices that give plausible results during the initial 210,000 years also predict that the Neanderthals should have survived the latter part of the Weichselian ice age, despite competing for food with Modern Human newcomers during the last part of the period. The conclusion is that other reasons for extinction than climate or starvation must be sought. UPDATE (Jan 13): John Hawks questions Erik Trinkaus about not citing previous work by Caspari and Lee. The establishment of modern humans in the Late Pleistocene, subsequent to their emergence in eastern Africa, is likely to have involved substantial population increases, during their initial dispersal across southern Asia and their subsequent expansions throughout Africa and into more northern Eurasia. An assessment of younger (20–40 y) versus older (>40 y) adult mortality distributions for late archaic humans (principally Neandertals) and two samples of early modern humans (Middle Paleolithic and earlier Upper Paleolithic) provides little difference across the samples. All three Late Pleistocene samples have a dearth of older individuals compared with Holocene ethnographic/historical samples. They also lack older adults compared with Holocene paleodemographic profiles that have been critiqued for having too few older individuals for subsistence, social, and demographic viability. Although biased, probably through a combination of preservation, age assessment, and especially Pleistocene mobility requirements, these adult mortality distributions suggest low life expectancy and demographic instability across these Late Pleistocene human groups. They indicate only subtle and paleontologically invisible changes in human paleodemographics with the establishment of modern humans; they provide no support for a life history advantage among early modern humans. Apparently, the expansion of the dairy breeds have created, or largely maintained, a sharp genetic contrast of northern and southern Europe, which divides both France and Germany. It may be hypothesised that the northern landscapes, with large flat meadows, are suitable for large-scale farming with specialised dairy cattle (Niederungsvieh, lowland cattle), whilst the mixed-purpose or beef cattle (Höhenvieh, highland cattle) are better suited to the smaller farms and hilly regions of the south. However, it is also remarkable that in both France and Germany the bovine genetic boundary coincides with historic linguistic and cultural boundaries. In France, the Frankish invasion in the north created the difference between the northern langue d'oïl and the southern langue d'oc. The German language is still divided into the southern Hochdeutsch and northern Niederdeutsch dialects, which also correlates with the distribution of the Catholic and Protestant religions. On a larger scale, it is tempting to speculate that the difference between two types of European cattle reflects, and has even reinforced, the traditional and still visible contrast of Roman and Germanic Europe. UPDATE: I wish there'd be some data points for the vast area between Eastern Europe and Yakutia. There might be a simple (and recent) expalanation for why Northeastern Europe is mostly "green" and Yakutia "red", but it would be nice to have actual datapoints in the quadrilater between NE Europe ("green"), SW Asia (mostly "red"), S Asia (zebu "black") and Yakutia. Ceiridwen J. Edwards et al. Diversity patterns of livestock species are informative to the history of agriculture and indicate uniqueness of breeds as relevant for conservation. So far, most studies on cattle have focused on mitochondrial and autosomal DNA variation. Previous studies of Y-chromosomal variation, with limited breed panels, identified two Bos taurus (taurine) haplogroups (Y1 and Y2; both composed of several haplotypes) and one Bos indicus (indicine/zebu) haplogroup (Y3), as well as a strong phylogeographic structuring of paternal lineages. 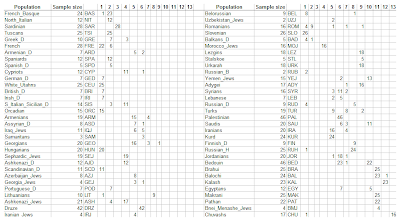 Haplogroup data were collected for 2087 animals from 138 breeds. For 111 breeds, these were resolved further by genotyping microsatellites INRA189 (10 alleles) and BM861 (2 alleles). European cattle carry exclusively taurine haplotypes, with the zebu Y-chromosomes having appreciable frequencies in Southwest Asian populations. Y1 is predominant in northern and north-western Europe, but is also observed in several Iberian breeds, as well as in Southwest Asia. A single Y1 haplotype is predominant in north-central Europe and a single Y2 haplotype in central Europe. 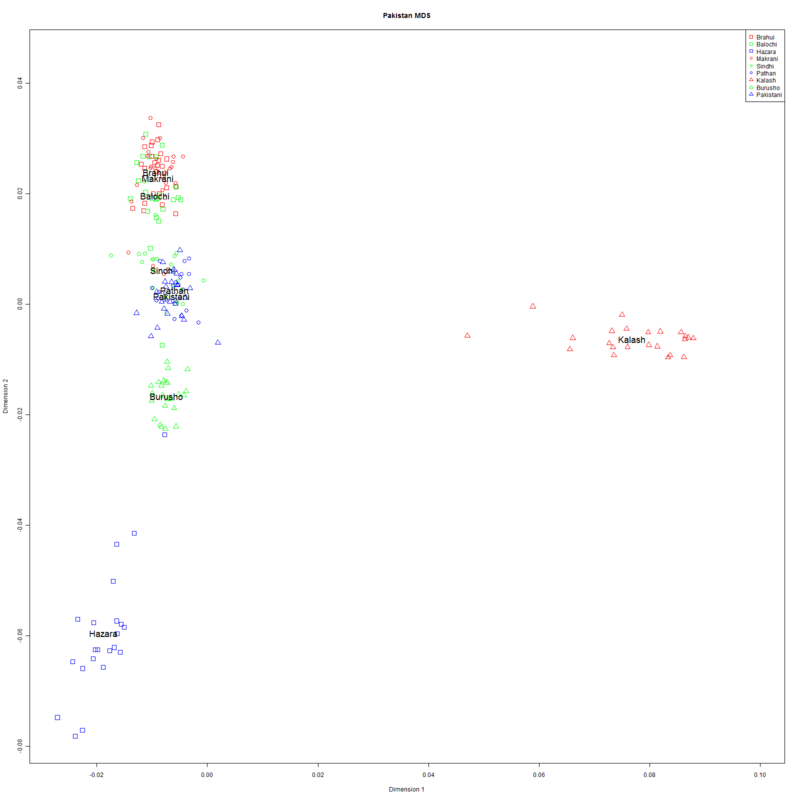 In contrast, we found both Y1 and Y2 haplotypes in Britain, the Nordic region and Russia, with the highest Y-chromosomal diversity seen in the Iberian Peninsula. We propose that the homogeneous Y1 and Y2 regions reflect founder effects associated with the development and expansion of two groups of dairy cattle, the pied or red breeds from the North Sea and Baltic coasts and the spotted, yellow or brown breeds from Switzerland, respectively. The present Y1-Y2 contrast in central Europe coincides with historic, linguistic, religious and cultural boundaries. 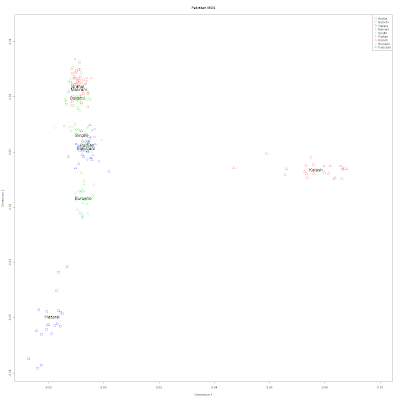 They sequenced ~45kb in 13 E1b1 chromosomes, producing an updated phylogeny of the -haplogroup (left). As you can see, increased phylogenetic inference comes at the cost of increasingly long-winded haplogroup designations; hopefully I'll manage to familiarize myself with the new terminology soon enough, and update this post with my comments. Haplogroup E1b1 now contains two basal branches, E-V38 (E1b1a) and E-M215 (E1b1b), with V38/V100 joining the two previously separated lineages E-M2 (former E1b1a) and E-M329 (former E1b1c). Each of these two lineages has a peculiar geographic distribution. E-M2 is the most common haplogroup in sub-Saharan Africa, with frequency peaks in western (about 80%) and central Africa (about 60%). The same haplogroup is also present in North Africa, although at a lower frequency (usually below 10%) –. Haplogroup E-M329, on the other hand, was observed almost exclusively in eastern Africa , [12 and R.S. unpublished data], where E-M2 is virtually absent. The second basal branch of E1b1, E-M215, has a broad geographic distribution from southern Europe to northern and eastern Africa where it has been proposed to have originated . The new topology here reported has important implications as to the origins of the haplogroup E1b1. 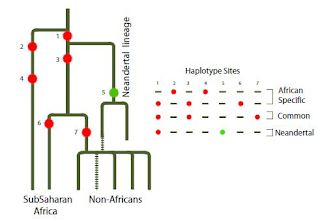 Using the principle of the phylogeographic parsimony, the resolution of the E1b1b trifurcation in favor of a common ancestor of E-M2 and E-M329 strongly supports the hypothesis that haplogroup E1b1 originated in eastern Africa, as previously suggested , and that chromosomes E-M2, so frequently observed in sub-Saharan Africa, trace their descent to a common ancestor present in eastern Africa. Within E-M35, there are striking parallels between two haplogroups, E-V68 and E-V257. Both contain a lineage which has been frequently observed in Africa (E-M78 and E-M81, respectively) , , , – and a group of undifferentiated chromosomes that are mostly found in southern Europe (Table S2). An expansion of E-M35 carriers, possibly from the Middle East as proposed by other Authors , and split into two branches separated by the geographic barrier of the Mediterranean Sea, would explain this geographic pattern. However, the absence of E-V68* and E-V257* in the Middle East (Table S2) makes a maritime spread between northern Africa and southern Europe a more plausible hypothesis. Haplogroup E1b1, defined by the marker P2, is the most represented human Y chromosome haplogroup in Africa. A phylogenetic tree showing the internal structure of this haplogroup was published in 2008. A high degree of internal diversity characterizes this haplogroup, as well as the presence of a set of chromosomes undefined on the basis of a derived character. Here we make an effort to update the phylogeny of this highly diverse haplogroup by including seven mutations which have been newly discovered by direct resequencing. We also try to incorporate five previously-described markers which were not, however, reported in the 2008 tree. Additionally, during the process of mapping, we found that two previously reported SNPs required a new position on the tree. There are three key changes compared to the 2008 phylogeny. Firstly, haplogroup E-M2 (former E1b1a) and haplogroup E-M329 (former E1b1c) are now united by the mutations V38 and V100, reducing the number of E1b1 basal branches to two. The new topology of the tree has important implications concerning the origin of haplogroup E1b1. Secondly, within E1b1b1 (E-M35), two haplogroups (E-V68 and E-V257) show similar phylogenetic and geographic structure, pointing to a genetic bridge between southern European and northern African Y chromosomes. Thirdly, most of the E1b1b1* (E-M35*) paragroup chromosomes are now marked by defining mutations, thus increasing the discriminative power of the haplogroup for use in human evolution and forensics. Scientists are planning an attempt to extract DNA from the 'hobbit' Homo floresiensis, the 1-metre-tall extinct distant relative of modern humans that was unearthed in Indonesia, following a study that suggests problems in standard sampling methods in ancient-DNA research could have thwarted previous efforts. This year, geneticists at the Australian Centre for Ancient DNA (ACAD) at the University of Adelaide hope to recover DNA from a roughly 18,000-year-old H. floresiensis tooth, which was excavated in 2009 from the Liang Bua site on the Indonesian island of Flores. The premolar has been kept cold, and has been handled as little as possible to prevent contamination with modern DNA. But little, if any, of the ancient DNA is likely to have survived the heat and moisture of the tropics, and any that has may be highly fragmented. The Nature piece is referencing a recent paper which may present a substantial progress in ancient DNA retrieval. If this is successful, given the shoddy conditions for DNA preservation at the site and its pre-Neolithic age, it will basically open up a whole vista of possibilities for ancient DNA retrieval in the last 10-20 thousand years from pretty much anywhere. It will also clear up the confusion about the status of the "hobbits": whether they are Homo floresiensis, pre-Homo, or pathological Homo sapiens. There are so many Upper Paleolithic samples that are unquestionably of our own species, that I am hoping that one of these days researchers will take a look at them as well. Neandertals, Denisovans, "Hobbits" are all interesting, but DNA extraction from iconic early sapiens skulls is something I am much more keen to witness. Predicting complex human phenotypes from genotypes is the central concept of widely advocated personalized medicine, but so far has rarely led to high accuracies limiting practical applications. One notable exception, although less relevant for medical but important for forensic purposes, is human eye color, for which it has been recently demonstrated that highly accurate prediction is feasible from a small number of DNA variants. Here, we demonstrate that human hair color is predictable from DNA variants with similarly high accuracies. We analyzed in Polish Europeans with single-observer hair color grading 45 single nucleotide polymorphisms (SNPs) from 12 genes previously associated with human hair color variation. We found that a model based on a subset of 13 single or compound genetic markers from 11 genes predicted red hair color with over 0.9, black hair color with almost 0.9, as well as blond, and brown hair color with over 0.8 prevalence-adjusted accuracy expressed by the area under the receiver characteristic operating curves (AUC). The identified genetic predictors also differentiate reasonably well between similar hair colors, such as between red and blond-red, as well as between blond and dark-blond, highlighting the value of the identified DNA variants for accurate hair color prediction. 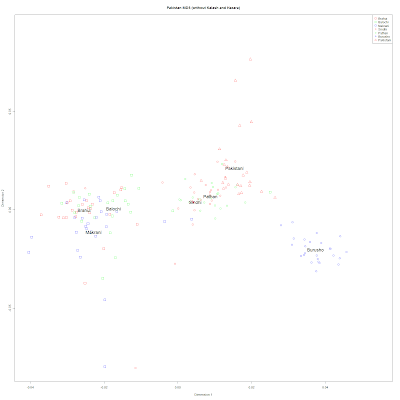 Here is a multidimensional scaling plot of 9 different populations of Pakistan I've collected in the Dodecad Project. The "Pakistani" population from Xing et al. (2010) consists of Arain agriculturalists from the Punjab region. 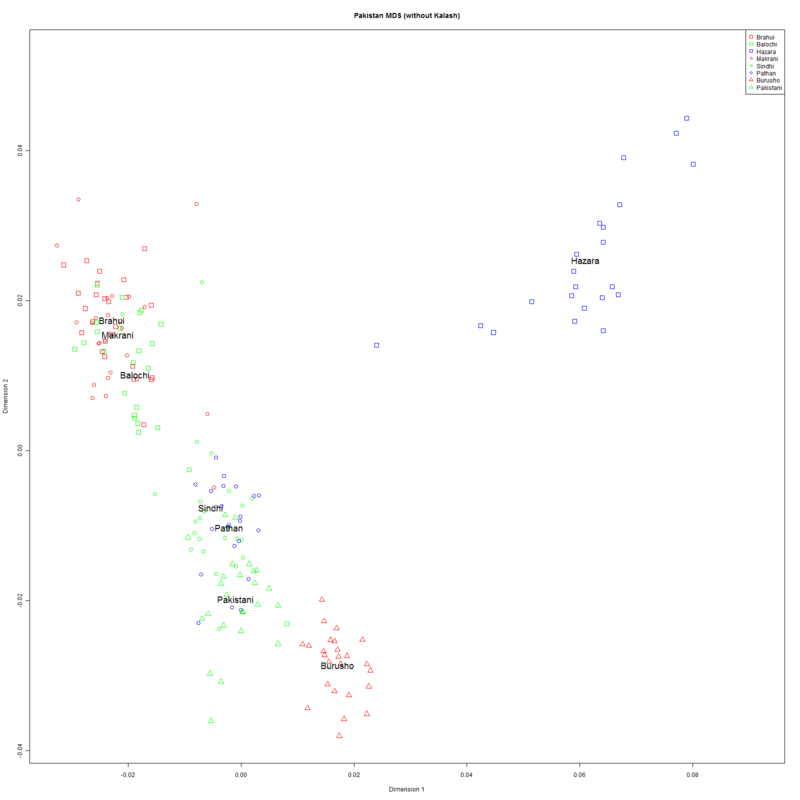 The isolated Kalash form cluster #5, and the part Mongoloid Hazara #4. The Burusho are a genetic and linguistic isolate, falling in cluster #3. The other 2 clusters comprise of multiple populations: Cluster #1 the Brahui, Balochi, and Makrani and could very well be termed "Balochistan". 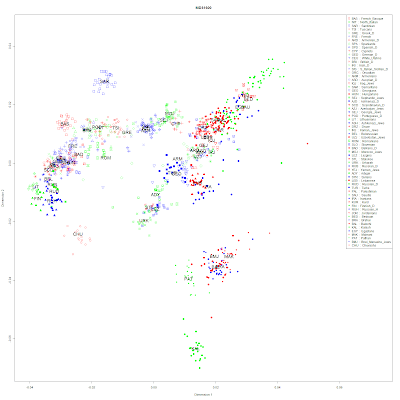 Cluster #2 comprises of the Sindhi, Pathan, and Punjabi samples. Undertaking a sea voyage to Crete, whether from the Greek mainland, Anatolia, or Africa is certainly a feat that requires substantial cognitive abilities (to build and navigate a boat). Supposedly this level of sophistication would have to wait for Out-of-Africa modern Homo sapiens. Could people like Apidima 2 from Mani, or whoever lived in Anatolia at the time have made the voyage? If the findings are confirmed, then they must have. The only thing that troubles me about the interpretation of this story is the idea that the Paleolithic settlers of Crete may have come from Africa. Pretty soon we'll be enganging in Heyerdahl-esque hypotheses about ocean-crossing Paleolithic man. A more parsionious hypothesis would have the settlers reach Crete from the Aegean, from either Europe or Asia. The data would, however, have implications about other prehistoric migrations. It has often been postulated that sea voyages in other parts of the world (e.g., to Australia) would not have been possible at particular periods when the distance was "too large" for the hypothesized cognitive abilities of early man. If true, the Cretan findings would make plausible many other sea voyages. Archaeologists on the island of Crete have discovered what may be evidence of one of the world's first sea voyages by human ancestors, the Greek Culture Ministry said Monday. A ministry statement said experts from Greece and the U.S. have found rough axes and other tools thought to be between 130,000 and 700,000 years old close to shelters on the island's south coast. Crete has been separated from the mainland for about five million years, so whoever made the tools must have traveled there by sea (a distance of at least 40 miles). That would upset the current view that human ancestors migrated to Europe from Africa by land alone. "The results of the survey not only provide evidence of sea voyages in the Mediterranean tens of thousands of years earlier than we were aware of so far, but also change our understanding of early hominids' cognitive abilities," the ministry statement said. "Up to now we had no proof of Early Stone Age presence on Crete," said senior ministry archaeologist Maria Vlazaki, who was not involved in the survey. She said it was unclear where the hominids had sailed from, or whether the settlements were permanent. "They may have come from Africa or from the east," she said. "Future study should help."